Much like any other environment, the workplace is always changing. Change is inevitable and it seems far more productive to embrace it rather than fight it. In today’s workplace, Millennials entering the work force have the power to influence a serious shift in the next decade and organizations are going to have to adapt. Millennials (Generation Y) are beginning to enter the business world and they are bringing with them their own culture and values. Social networking, multitasking, and technology are a way of life for this generation. According to research, the average millennial has received more education than the average young adult from previous generations and it is assumed that most of Gen Y will join the creative class as knowledge workers. Already millennials are changing how work is both perceived and achieved. 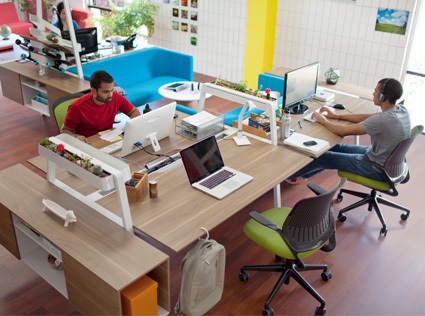 The “Y Factor”, a Steelcase research term, represents 8 major cognitive and behavioral shifts of the creative class worker. And the spirit that drives the Y Factor? Generation Y. Here’s a look. It is one thing to attract employees but it’s another thing to engage and retain them. Attracting and engaging the 21st century workforce is one of three key areas of strategic business focus. In order to attract, engage, and retain the best talent, an organization must prepare for the Y Factor. Spaces that match cognitive intensity or spaces that allow employees to express their individuality are examples of how the workplace itself can be a physical supporter of the major shifts above. So employers, if you haven’t already caught on to these shifts, you heard it here from a millennial herself – prepare to change or be changed! For a deeper dive on the Y Factor and workplace planning design strategies that support the Y Factor, check out these links!